Firstly I’d like to start with a thank you to the very nice guy at work who gave me a bag of these to try and to review. They are the new offering from Hula Hoops and are available in multi packs. Hula Hoops are crunchy rings of potato, and are a bit of a classic snack here in the UK. It is always good to find a new flavour of them too. This new variety is called Sweet Chilli and I immediately assumed it would taste of sweet chilli dipping sauce, but when tested it didn’t quite represent that. The flavour isn’t bad, though and I did enjoy the bag. They have a light kick of spice, but are predominantly paprika in taste. There are other aspects to the flavours too, with hints of onion and the sweetness of tomato mixed in. They have a tangy taste, and I was pleased that the chilli had a nice warmth. They are certainly a good addition to the range and I really enjoyed them. Most people I know who’ve tried them agree that they are good but one notably was unimpressed. Have you tried them – what did you think? 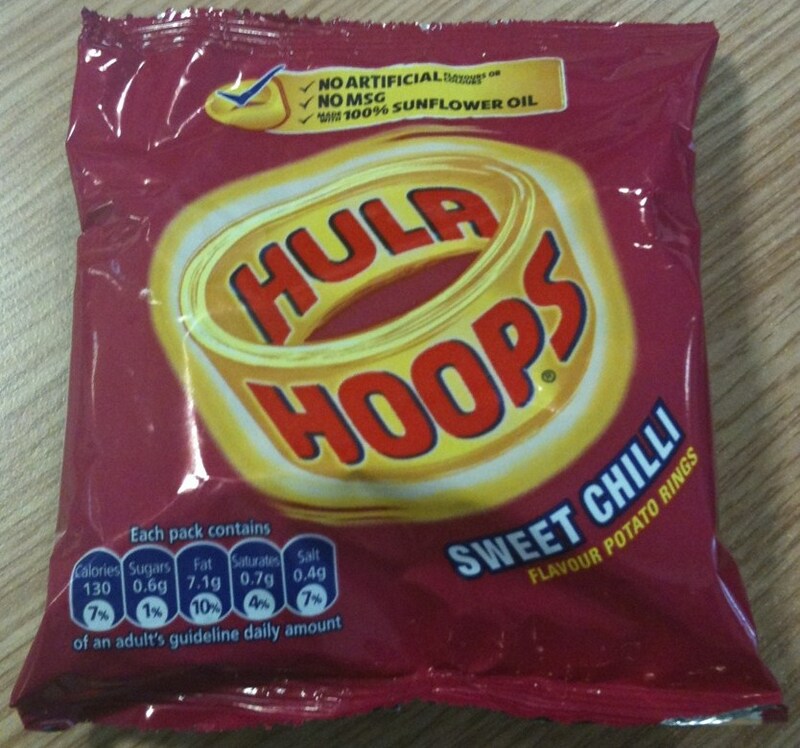 I have seen these but only in the sharing bags, keep meaning to try them but not a huge hula hoops fan. I only got these in the Big Hoops share bag, but I'm sharing them with myself over a few days, so that's alright, isn't it? Have you tried the Walkers Sensations sweet Chipotle chilli yet? They're nice too. Dreich - have you tried them yet? What did you think? Worryingly I also consider eating chocolate or crisps as research for Foodstuff Finds and not snacking... Chipotle review is up now - and I have sourced a bag of their goats cheese flavour too!